Hate the clutter of having a modem and router powering your WiFi setup? We do as well, and so do many others. That’s why modem router combos are taking over the home Internet sector by storm, allowing you to bring all of the devices required to power your home Internet into just one, low profile device that takes up little space. Not sure what modem router combo is right for you? If you follow along with us below, we’ll show you seven of the best that you can buy today. Let’s dive right in. Coming up as our number one choice, we’re looking at the Motorola MG7700. The model MG7700 is a cable modem, but it’s also a AC1900 dual band Gigabit router that can operate on 2.4GHz and 5GHz bands. There are actually four Gigabit ports available. Since it is a modem and router combo, you’ll need to get approval by Comcast for use. One of the nice things about going with the Motorola, and router modem combos in general, is that you can save on some pretty expensive equipment rental fees on a per month basis. There’s actually a Wireless Boost feature that should be able to make sure you’re getting a wireless signal throughout your entire home. The NETGEAR AC1200 is an excellent choice for those that are looking to clear the clutter of modems and routers around their home. This one is actually certified by use for Comcast, so after just a quick call to Comcast to get this one provisioned, you’ll be up and running in no time. In addition to being certified for Comcast, this one also supports Spectrum, Cox, CableONE, and a handful of other services.. This one isn’t a Gigabit router, but should easily provide you with up to 350Mbps in Internet speeds, depending on the plan you have with your ISP. One of the neat things about the AC1200 is that there’s a number of content filtering features inside the router, allowing you to keep the Web safe for your children while on this connection. The Nighthawk AC1900 modem router offers extremely fast Wi-Fi speeds of up to 960 Mbps thanks to 24×8 channel bonding, which is an arrangement of communications links in which two or more links are combined for redundancy or increased throughput, and a powerful 1.6 GHz processor capable of handling simultaneous streaming and gaming. The Nighthawk also supports adaptive beamforming, a technology that allows it to focus its Wi-Fi signal in a single direction for better signal strength. 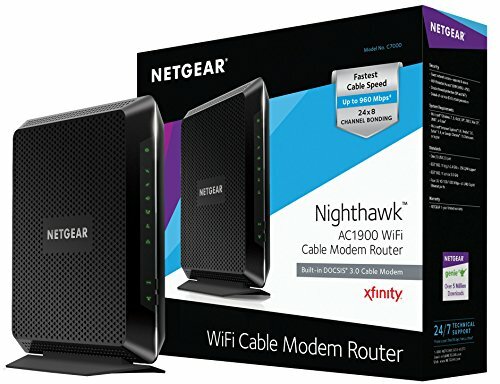 All these advanced features make this modem router combo perfect for fast Internet services like Comcast XFINITY Blast/Extreme and users who require peak performance at all times. With the Netgear Genie app for iOS and Android devices, anyone can set up and configure the Nighthawk AC1900 modem router in a few minutes and conveniently access all of its features, including wireless settings, network map, parental controls, guest access, traffic metering, MyMedia, and more. The Model MG7550 is among the most popular modem router combos on Amazon because it combines the reliability of a 16×4 cable modem with the performance of an AC1900 Wi-Fi gigabit router. According to Motorola, the MG7550 has been designed with services from Comcast, Charter Spectrum, Cox, and Time Warner in mind, ensuring out-of-the-box compatibility. The 16 downstream channels support speeds up to 686 Mbit/s, and the 4 upstream channels handle speeds up to 123 Mbit/s. Inside the router are three antennas with three send and three receive channels, and the MG7550 can intelligently boost its wireless transmission power for extended speed and range. It can also focus the signal on individual wireless clients thanks to the support for beamforming technology. Stationary devices, such as desktop computers and HDTVs, can be connected to the Internet via four Gigabit Ethernet (GigE) LAN ports. For such an affordable modem router combo, the Actiontec GT784WN is a surprisingly capable little device with support for a host of modern networking technologies that significantly improve its performance. Perhaps the most important of all is called MIMO (multiple-input and multiple-output), and it’s a method for advanced signal processing that helps wireless routers identify spatial signal signatures and use them to calculate beamforming vectors. 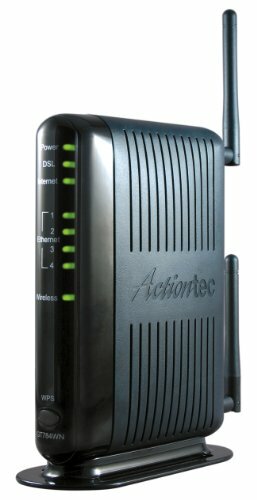 As such, the Actiontec GT784WN modem router combo can focus the signal on a single client to achieve better wireless speeds and minimize signal drops. Besides MIMO, the Actiontec GT784WN also supports the IEEE 802.11n wireless standard, which has the maximum net data rate of 600 Mbit/s, as opposed to the maximum net data rate of 54 Mbit/s of the two previous standards, 802.11a and 802.11g. Built into the router is a robust firewall and security suite with support for the latest wireless encryption standards, packet inspection, denial of service protection, content filtering, and more. Certified for XFINITY from Comcast, Spectrum (Including Charter, Time Warner Cable, and Bright House Networks), Cox, Suddenlink, Mediacom, and WOW, the TP-Link N300 TC-W7960 is an affordable modem router combo from a trusted company that keeps its products up to date and offers an industry-leading 2-year warranty and unlimited 24/7 technical support. The TC-W7960 is an elegantly compact 2-in-1 device that can replace your ISP’s rental modem and transmit a strong Wi-Fi signal to every room in your home. The device offers the maximum speed of up to 300 Mbit/s on 2.4 GHz, has four Gigabit LAN ports, a single USB port, two internal antennas, and supports DOCSIS 3.0, which is an international telecommunications standard that permits the addition of high-bandwidth data transfer to an existing cable TV system. Because TP-Link N300 TC-W7960 is compatible with most major cable ISPs, it’s perfect for people who want to get rid of rental fees without having to deal with modem configuration. The SURFboard brand of modems has been around since 1997, and consumers associate it with stellar customer service, fantastic reliability, and affordable prices. 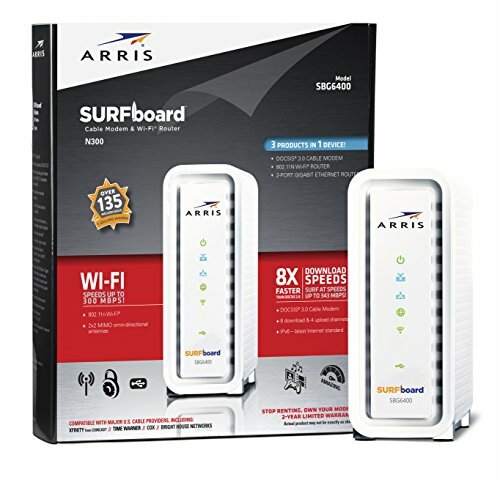 The ARRIS SURFboard N300 SBG6400 modem router combo is no different than other products that carry the SURFboard brand name. It combines a DOCSIS 3.0 cable modem, dual-band concurrent 802.11ac Wi-Fi Access Point and 2-Port Gigabit Ethernet router in a single, compact device. Included with the ARRIS SURFboard N300 SBG6400 modem router combo is a quick start guide and US-based technical support contact information. The device has been certified for compatibility with Comcast Xfinity, Time Warner Cable, Charter, Cox, and Cablevision, but it is not compatible with Verizon, AT&T, and Centurylink. As you can see, there are a lot of awesome router modem combos available today. We’re only scratching the surface on what’s available today; however, these are surely some of the best that you can buy today. We especially think that Netgear’s Nighthawk is worth investing in, as it’ll get you pretty close to gigabit speeds. 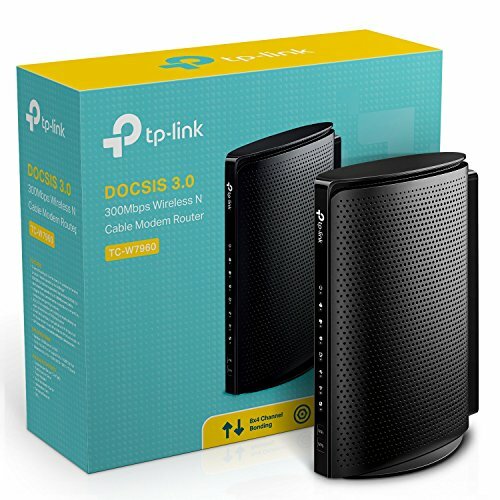 Do you have a favorite router modem combo? Sound off in the comments section below — we’d love to hear from you!